A duplicate of a statue that represents Coventry’s commitment to peace and reconciliation is to be unveiled in Belfast today to encourage the different sides in Northern Ireland to keep searching for common ground. “Reconciliation” is to be presented to senior Ulster politicians in the grounds of Stormont Castle by a party from Coventry Cathedral. 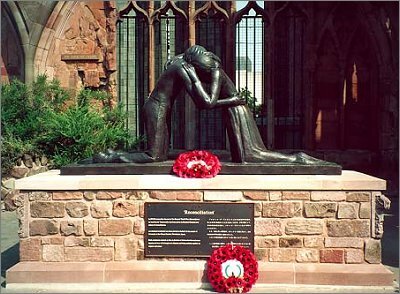 Other copies of the statue, which features a young man and woman kneeling to embrace across a divide, stand in Hiroshima, on the site of the Berlin Wall and in the ruins of Coventry Cathedral. The copies of Reconciliation, by sculptress Josephina de Vasconcellos have been funded by Sir Richard Branson. The statue was offered to the people of Northern Ireland through Secretary of State Peter Mandelson earlier this year. It will be presented by the acting Dean of Coventry Cathedral, the Rev Canon Stuart Beake, and its Director of International Ministry, Canon Andrew White. The First Minister David Trimble, Deputy First Minister Seamus Mallon, Lord Alderdice and other political and civic leaders will be present. During the ceremony, embassy representatives from Japan, Germany and Israel – where the next statue is planned - will throw pebbles from their respective countries into the statue's surrounding water garden, and stone boulders bearing the names of each country will be situated by the water's edge. "These sculptures remind us that human dignity and love will triumph over disaster and bring nations together in respect and peace." Ordinary people from Northern Ireland's different communities, including school children, will witness the event. They have been invited on the Cathedral's behalf by Trevor Williams, the leader of the Corrymeela Community, based in Belfast and on the Antrim coast, one of Coventry Cathedral's many "Cross of Nails" centres of reconciliation across the world. "The Statues of Reconciliation have brought hope to various communities around the world who are on the long journey towards reconciliation. “We hope that the statue here will be a powerful symbol to all peoples of Northern Ireland as they work to live in peace together across their traditional divisions."